Image credit: Paul Klee, ‘Colourful Group’, 1939 (via Wikiart). Jimmy Smith, director general of the International Livestock Research Institute (ILRI), gave a keynote presentation at the 16th Asian Australasian Animal Production Congress, held in Yogyakarta, Indonesia, 10–14 Nov 2014. The overall theme of the congress was ambitious: ‘Sustainable livestock production in the perspective of food security, policy, genetic resources and climate change’. Below are his main points. You can view his whole slide presentation here. 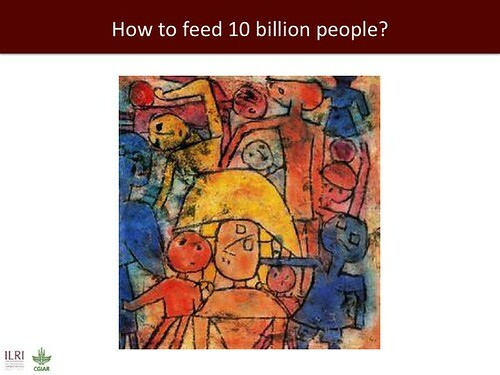 As the world looks towards the future, considers the new sustainable development goals and the prospect of feeding at least 10—maybe more—billion people, it is important that we consider what we have learned from the recent past and how that might inform the coming decades. This presentation considers the lessons of the food price crisis in 2007/08 and translates these, and other trends and policies, into policy-related propositions concerning in particular the livestock sector and its role in food security. 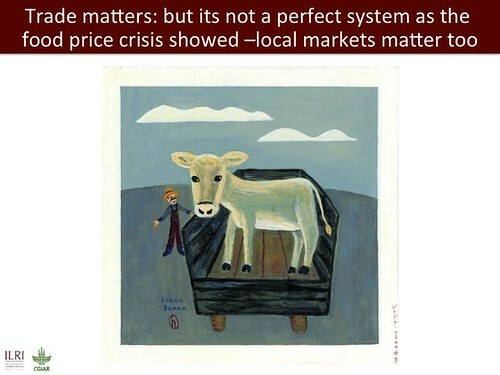 First, let’s consider some of the broad issues emerging from the global food price crisis of 2007/08—less than ten years ago. Image credit: Simi Gauba, ‘Tell-a-tale’ (via tigerprint.typepad.com). The world was successful in agricultural production during the 1970–90s. 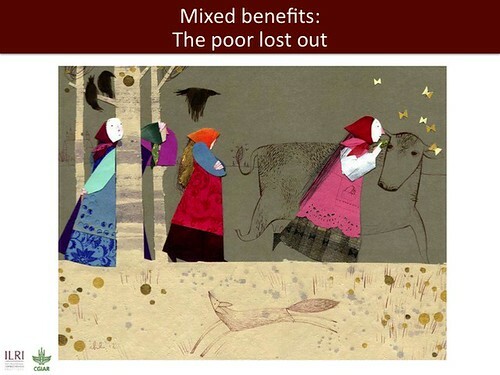 In many countries, especially in the developed world, there was an abundance of food, to the extent that special programs and policies emerged to deal with the excess. Image credits: Azzaharahman (via Instagram) and Cow Butcher Diagram–‘Use Every Part of the Cow’ cuts of beef poster (via Etsy). To many people, food seemed to come from supermarkets. As a result, in many places there was little investment in agriculture as a whole, and agricultural investment as a portion of ODA fell from about 15% to 2%. 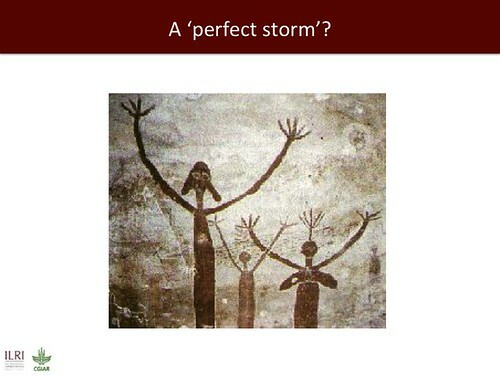 Image credit: Ancient Australian aboriginal art (via lancelot47.livejournal.com). These elements, together with their underpinning policies and investment decisions, came together to create a major crisis in 2007/08. 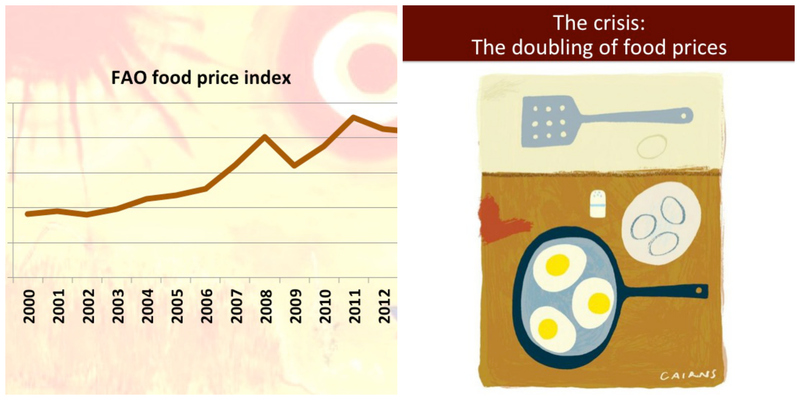 Food prices rose and in some cases doubled. In most cases prices have not returned to levels before this period and there have been further spikes since then as demand and supply remain asynchronous. Agricultural productivity improvements had stagnated; the ‘mountains of food’ were in fact declining. Image credits: Marc Chagall, ‘A Wheatfield on a Summer’s Afternoon’, 1942 (via Wikiart) and Brian Cairns, ‘Eggs’ (via briancairns.com). 20 million people benefited from high prices for the food they produced and sold. But because the poor use most of their income to buy food, 60 million fell into poverty. Some 40 million people were hurt by this one shock. Global food balance is meaningless. 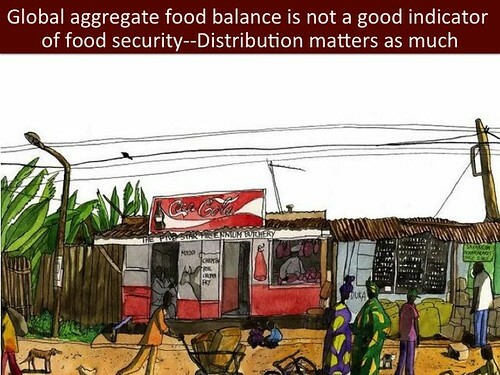 A global aggregate view of food availability, based on comparing global aggregate production and consumption, is inaccurate and misleading because it says nothing about how that food is distributed and available to those who need it. Trade matters. Some nations that were exporters of food stopped exporting in fear they’d run out of food and have mass unrest and hungry citizens. This in many cases led to the collapse of food trade systems. Image credit: Nguyen Phan Chanh, ‘La Marchand de Riz’ (‘The Rice Seller’), 1932. 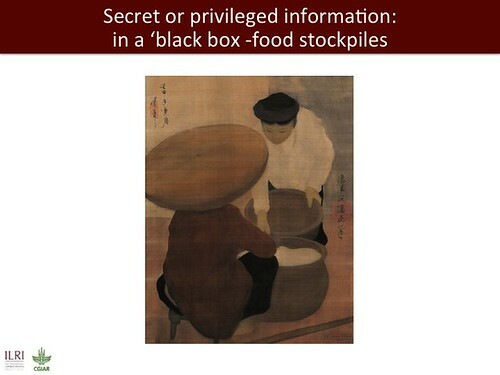 Food stockpiles became secret information. Major countries producing food, and big traders of food and food products, would not disclose information. As a result, no one knew how much food was available. Image credit: Fabio Sironi illustration, printed in the 2010 calendar of Italian NGO Amani (via AFRONLINE). Nations unable to produce all their food took drastic measures. A dramatic increase in foreign direct investments occurred as countries unable to produce all the food they need invested in producing food in other, relatively land- and resource-rich, countries. Image credit: ‘La vaquita parda’ (via tierradehojas.blogspot.com.es). The overriding lessons is that policies that ignore the role of agriculture in food production are dangerous and have major ramifications. Image credit: Yuki Sasameya: ‘Untitled’ (via en.tis-home.com). 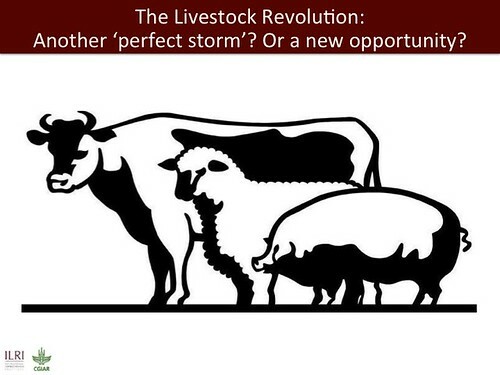 If we consider the livestock sector, it is pertinent to consider if there are opportunities to apply such lessons and thus avoid a similar crisis in future. Now is the time to do this. Although the global livestock sector is highly diverse and any generalizations we make may mask that diversity, there are some striking parallels that should sound warning bells. Despite playing a significant role directly and indirectly in food security, the livestock sector is often ignored. While recognition that demand for livestock commodities is growing rapidly (many times faster than for crops), especially in Asia, there is little recognition of how that growing demand may be met and that smallholder production has a role (and is today the major source of livestock products). Image credit: Animal silhouettes (via Twitter.com). Is it another ‘perfect storm’? Image credit: ‘Keep Calm and Milk a Cow’ poster (via Etsy). What sort of policy issues should be considered? 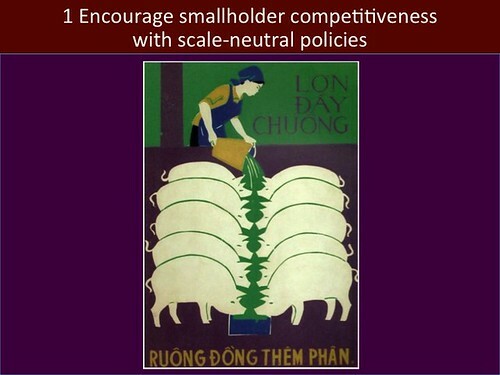 1 Those that provide an enabling environment for smallholder livestock farmers to be more competitive (such as scale-neutral policies that don’t discriminate against local markets). Image credit: ‘More Livestock, More Manure’ poster, Que Binh, Vietnam, 1972. 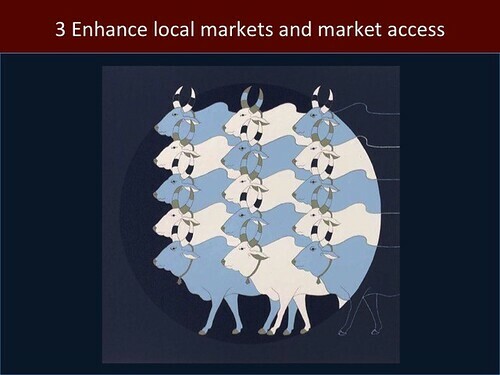 2 Those that use livestock market trends to help transform rural economies by supporting smallholder farmers and herders. 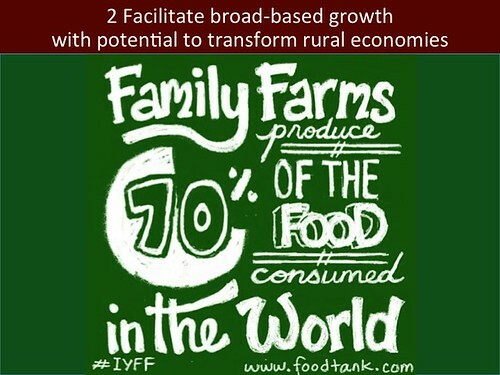 Image credit: ‘Family Farms Produce 70% of the Food Consumed in the World’ poster (via foodtank.com). 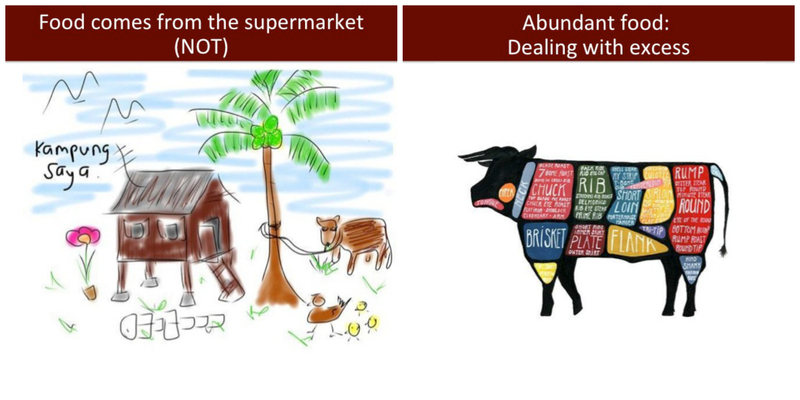 3 Those that support local, informal livestock markets, where most livestock products are being sourced in developing countries (the supermarket sector is growing, but slowly). Image credit: Olivia Fraser, ‘Blue Dawn’, 2012 (via bbc.co.uk). 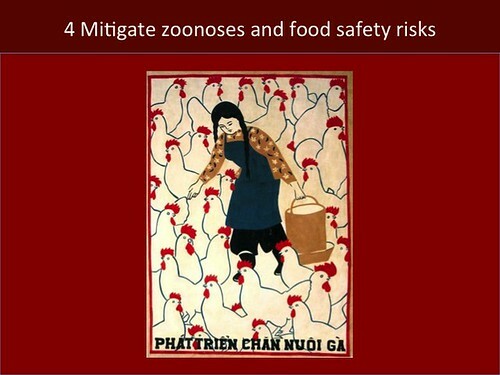 4 Those that attend closely to relationships between animals and people and that take into consideration the threat of zoonotic emerging and re-emerging diseases that arise when people and animals live in close proximity. Image credit: Artist unknown, Vietnam poster (via animalsvietnam.wordpress.com). 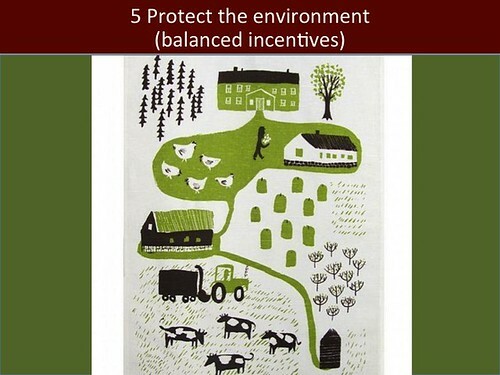 5 Those that ensure environmental issues are taken fully into account. Increasing concentration of livestock enterprises, often separated from sources of livestock feed, can result in nutrient loading (as seen in Europe and the US, as well as in Southeast Asia). There are opportunities for smallholder livestock enterprises to intensify—become more efficient—without damaging the environment. Appropriate incentives and supporting technological interventions could make a major difference to the future impact of the livestock sector on the environment. Image credit: Kauniste Maatila, ‘Green Farm’; handprinted kitchen linens inspired by 60s & 70s Finnish textiles (via store.mjolk.ca). Tags: AAAP Congress, Jimmy Smith. Bookmark the permalink. Previous post ← African Animal Annals: Deadly trifecta of climate change, population and disease?